Burlap and ribbon seem to be a good pair — don’t ya think? I made some mini pillows to go in my little vintage wagon. 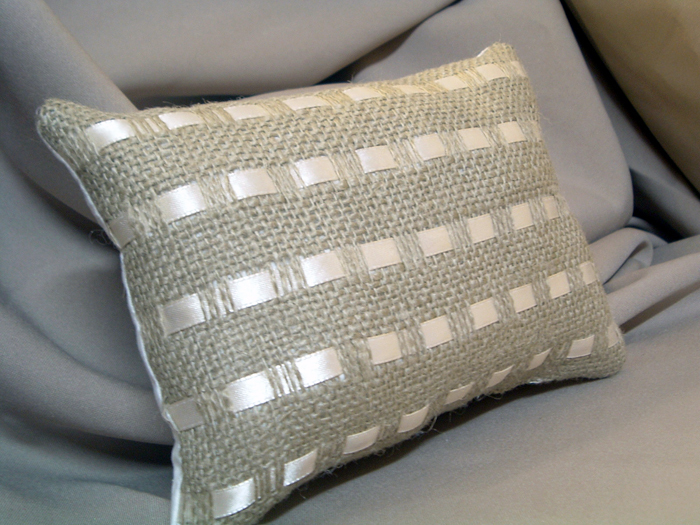 These burlap and ribbon pillows can be made in any size and are a fun project. I love how the satin ribbon accents the rustic burlap. I think they have a “pottery barnish” feel. So, wanna make some? 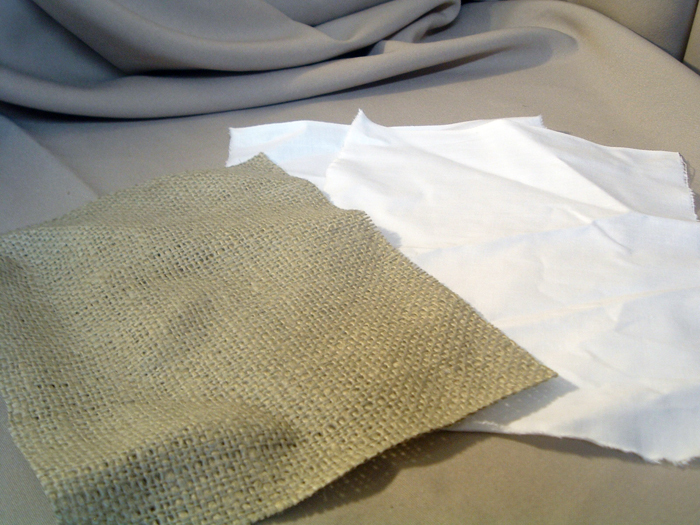 You will need burlap, ribbon, and some other fabric (white cotton works). For the first rectangular version, I cut the burlap and fabric into 7×9 inch squares. It will make about a 6×8 inch pillow. Of course you can make any size you wish…. Be sure to cut off the tighter weave of the selvege edge of the burlap — just trust me on this one. 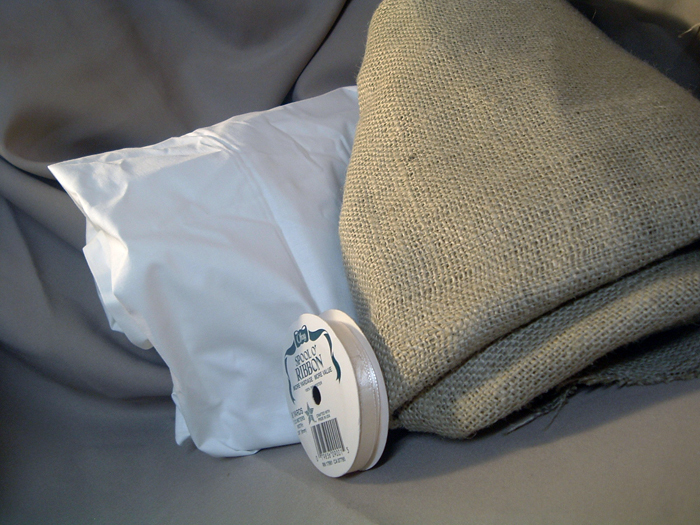 Here is the secret — you can remove those strings in the burlap. Yep just lift one up with one of those rippers used for sewing — pull on it and it will come out! I removed 4 together because that was about the width of my ribbon. I skipped double that amount (8 in this case) in between. Make as many of these “lines” as you desire. Then I just threaded the ribbon in and out on these lines. 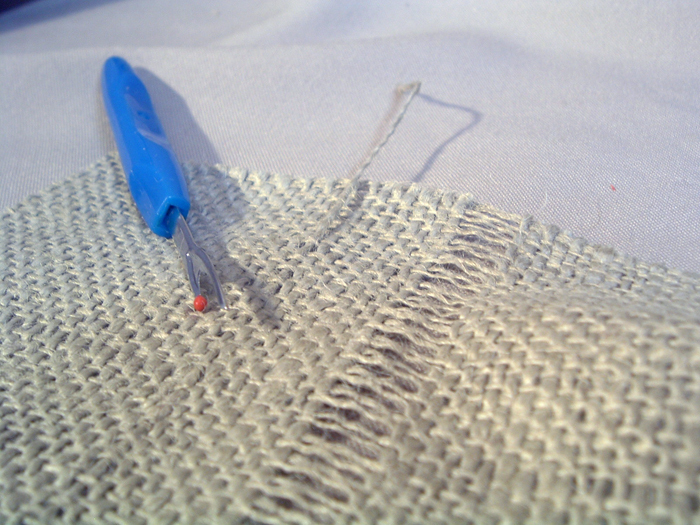 I went 5 strands when threading in and out — again up to you — no rules here! 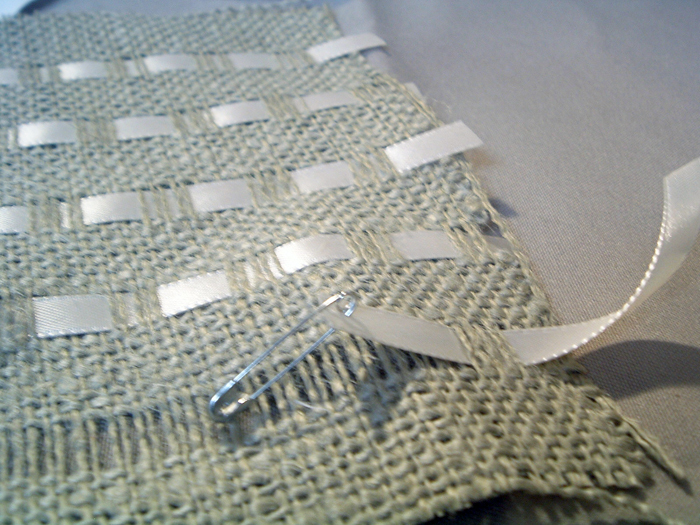 Yep — now the sewing part. 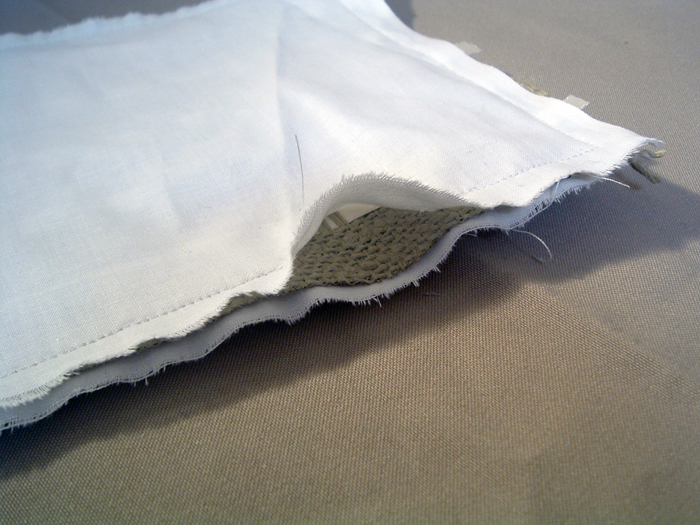 Just sew all around leaving 2-3 inches as a gap. Turn right side out through that hole. And start stuffing…. And for the other variation — same techniques just slightly different. 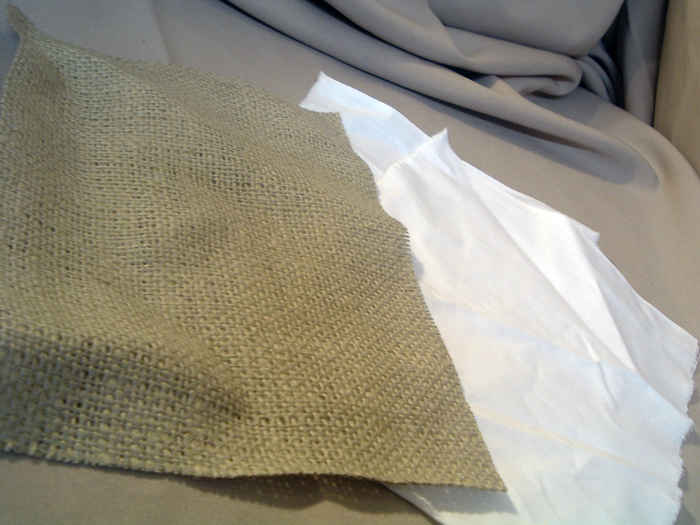 Cut your burlap and cotton into 7×7 inch squares. 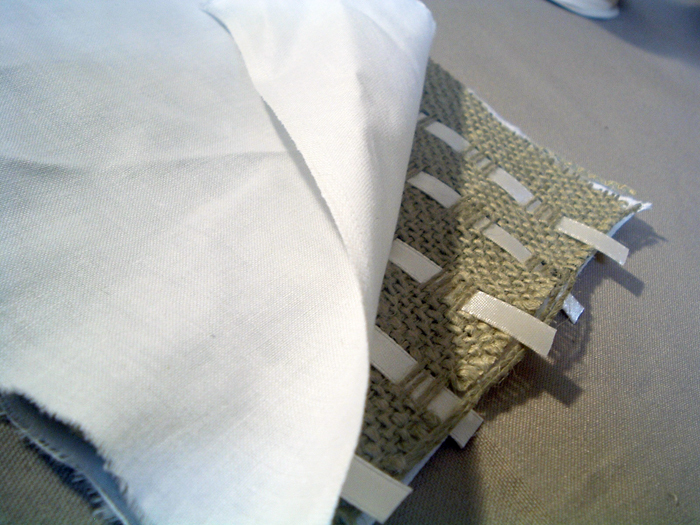 Making a 6×6 inch pillow. 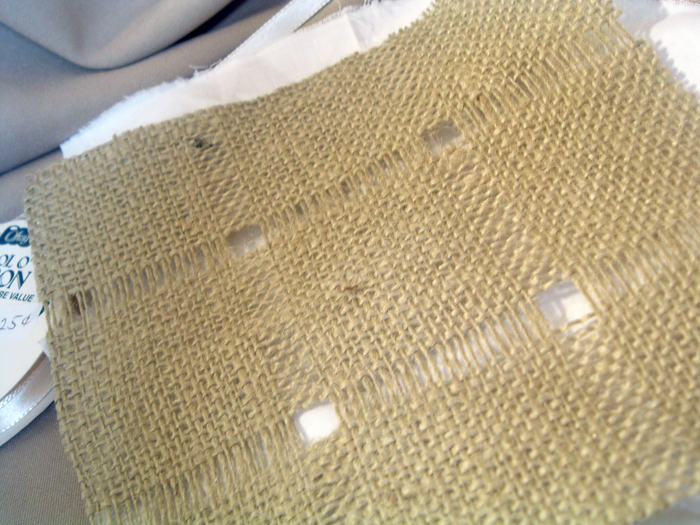 Stack the burlap between the cotton again and sew it up — leave that 2-3 inch gap. Turn right side out and stuff as desired. 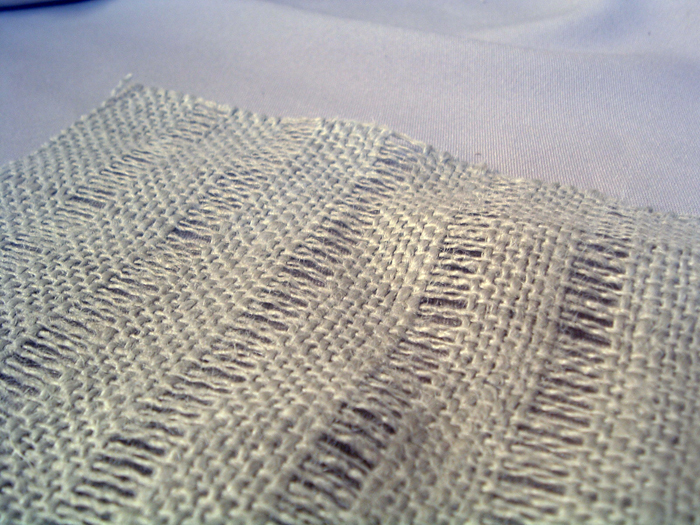 Sew up that slit. Stand back and admire how cute they look…. Like that burlap and ribbon look but don’t sew? Stop by tomorrow when I make something with burlap and ribbon that requires NO sewing. So think these are deserving of a “pottery barnish” label? 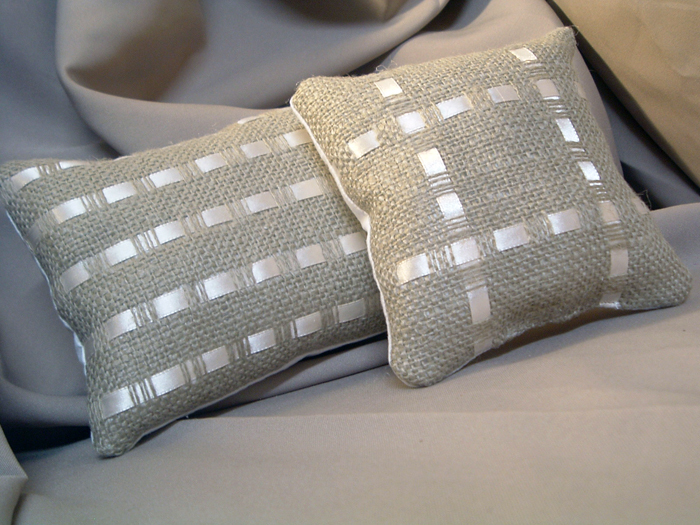 I am in love with these burlap and ribbon pillows! Love burlap? 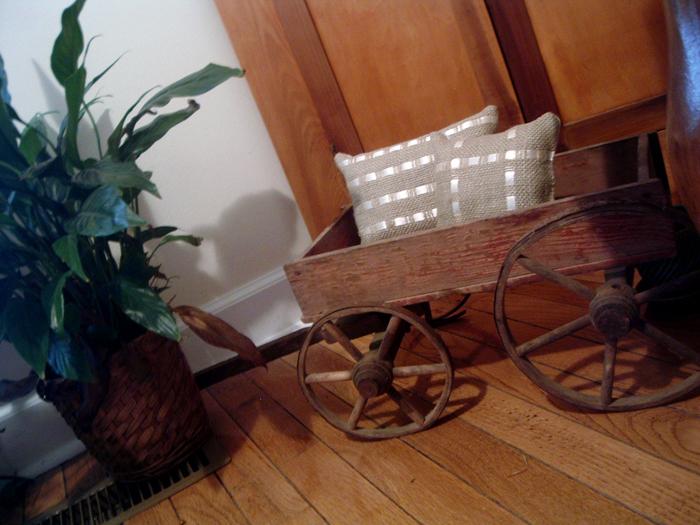 Be sure to check out all of our burlap projects. Those look so dainty and feminine! Very pretty! Oh, my gosh! Those are amazing. I am definitely book marking these and making some. They would make great gifts too. Adorable and definitely very PBish! Those look great! I love the contrast of the ribbon and burlap, great job! You are one smart cookie!!! This is such a good idea…and I have been trying to keep those darn strings from coming out all of this time! I always love a new idea for burlap! I’ll be trying this for sure! Oh my heck!!!! How do you do it? Every post of your is dynamite! 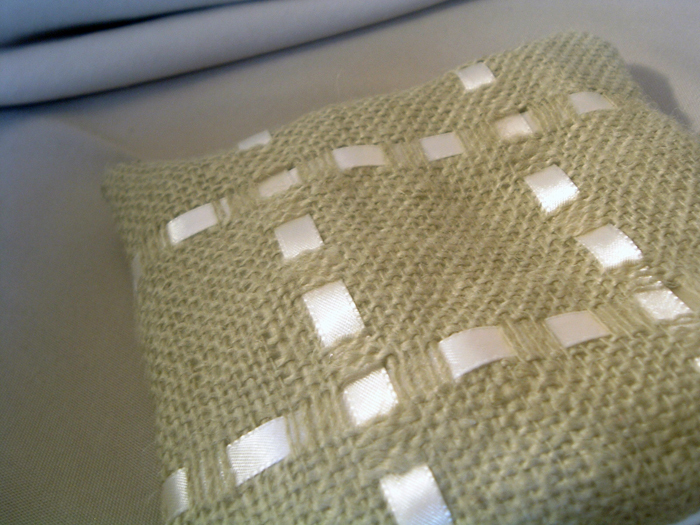 I will feature this one at somedaycrafts.blogspot.com on Tuesday. Will you please come guest blog at my site? email me at [email protected] You need to increase your followers so they can see your creativity!!! These pillows are gorgeous!!! I would love to try to make some too. Beautiful. Thanks for sharing. Love & blessings from NC! I LOVE these!! The little bit of satin ribbon softens it up so nicely and adds a bit of class. Thanks for sharing. I’ve posted a link. Very original, and I love it! They look like 50$ pillows. Thanks for sharing! these are simply stunning…thanks so much for sharing…love them. I love this idea! How clever. THOSE are gorgeous. And you could totally see those on Etsy. SO CUTE. Now I need some burlap!!! I am such a pillow lover and burlap lover. You did a fantastic job making those. I would not have the patience to do that tedious job. Okay, I am totally going to nab this idea… it’s beautiful, sort of log cabin, chrystal chandelier, rust and lace, you get what I maen. Those are adorable!!! 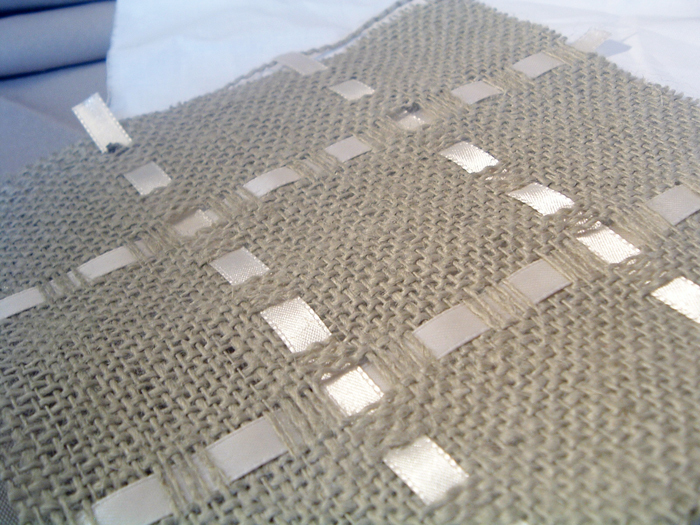 I love how you weaved the ribbon in the burlap, I would have never thought of that. Thanks for the great idea! My jaw just hit the floor. This is BRILLIANT! very creative! Love the different angle you took with the burlap. Maybe I should try this burlap thing everyone is talkin about. Super cute wagon as well! So original and great. I love the combo of the feminine ribbon with the burlap. I think somebody copied you! I swear I saw these in a catalog – nice combo of rustic and feminine! I love the contrast of the shiny satin ribbon and the rough burlap. They turned out great! what a cute & inventive idea! These are beautiful! I found these on Craft Gossip and I’m so glad I clicked over. I would love to link to these if you didn’t mind. These are SO pretty! What a creative idea! I love this! I’m featuring it on my blog tomorrow! Come grab my featured button! You work full time, have 3 kids and you’re fabulously creative! Love the pillows! Sweet! I love this new variation! Nice to see something fresh and different out there. I’m featuring you tomorrow for Motivate me monday! I love this so much! I love a good throw pillow project! Thanks for sharing such a great idea! Love the pillows. Great job. I love the combination of burlap and shiny ribbon. I will probably use this technique to make living room drapes! I featured it on this week’s Fab Friday Favorites . I hope you stop by, grab a button and stay and visit awhile. Loved your tutorial, I’ve linked up to you on my blog…New to blogging! Thanks for the inspiration! I just love the contrast of the rough with the shiny ribbon, gorg!!!! Love this idea. I’ve seen so much burlap recently, but nothing like this! Nice work! Visiting from CSI. These are beautiful!! I’m totally motivated to follow your tutorial! Thanks!! These pillows are sooooooo cute! Great job! Just absolutely beautiful! The ribbon glows against the burlap. These are so WOW! I’m definitely going to be doing this. Thanks for sharing such an easy to understand tutorial as well. Lovin’ your use of burlap and ribbon. Very clever!! Awesome pillows! 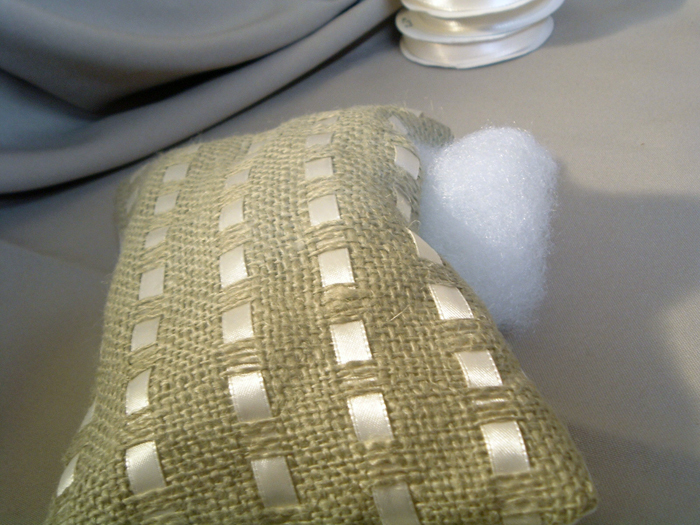 I love the smooth shine of the ribbon next to the rough texture of the burlap. These pillows look great – nice job! Ive cut burlap and have had it start falling apart. Do you run into this problem when cutting the measurements and lines for threading? If you are having issues, try a product called fray check. Run across the line before you are going to cut or the edge right after. It should take care of the problem. You can find it in the sewing area in most stores.